I think I would have liked it better with the final panel you mentioned. I don't see where you would have had room for it, though. I think it's hilarious, but when I first saw the horse all I could think of was Guernica. Spotting you, gleefully stating, "Gimme pie," and receiving my Bizarro cards from you would make my life somehow more complete. Alas, I'm in Colorado. Dammit. Such a genius. Love your stuff. I can't find the third, I really can't find the third, Mr. Piraro! Please help me Mr. Piraro or I'll keep on staring at the comic for a further 10-12 hours before I can give up. Btw, I do so love the way you painted the sky and also the face of the really happy horsey in the last panel of the comic, Mr. Piraro. You're right, there are only 2 symbols. I can't find the third, either. My editor usually catches mistakes like that. Either that, or I hid he last one so well I don't remember where it is. gosh diggity damnit i missed the renegade craft fair?? fugg it, just too much going on right now! son of a beach ball! i love the renegade craft fair, that's where i bought an old bing crosby record that was converted into a wall clock made from a lanky man in ontario. he traveled all the way just to sell his homemade wares at mcCarren park...sigh gotta love brooklyn! did i miss anything good? aw fugg it, don't tell me, i don't want to hear all the goodies i missed! poo poo de poo. Usually I get your cartoons, but this time I completely misunderstood, until I read your blog. I didn't catch on that the horse was wiggly and boneless, I just thought it was struggling in the desert, and came upon the remains of a lost companion, upon which he expressed satisfaction rather than grief at his discovery. I just figured you were being all dark and stuff. Well it took about 5 minutes of severe contemplation, but I finally got it. At first it just looked like it was supposed to be a Picasso, which is understandable. I mean, how many of us have tried to draw a horse with no bones? 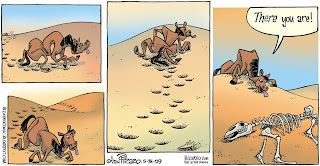 I really like it, because of the inventive quasi cubist illustration of a boneless horse, and because of the sheer originality- my favorite bizarros are ones where I never once thought of anything resembling the idea in the comic. Those bones belong to a still living animal?? Aaaah! Short circuit! I mean, how many of us have tried to draw a horse with no bones? I sometimes wish I were a pastor, so that I could pepper my Sunday sermons with quotes like this one.